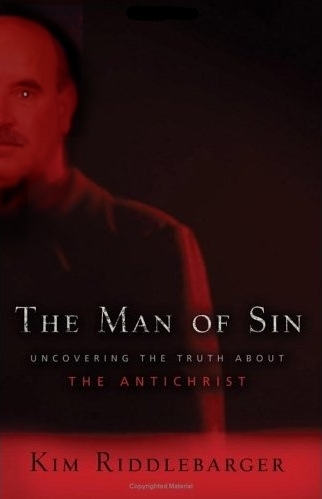 So, I'm watching the History Channel's program "The Antichrist." Except for interviews with prophecy "experts" like Ted Haggard and Tofik Benedictus (Benny Hinn), it wasn't bad. Hal Lindsey--the man of many mustaches (Click here)--was the primary dispensational expert, but people like Fuller, McGinn and Boyer, were interviewed as well. All of a sudden, I look up and there's the cover of my book! It wasn't on for long, but it was there! The next time History Channel ran the program, I DVR'd it. My two seconds of fame! Immortalized on my hard drive! Warhol said I'd get 15 minutes, not two seconds. in Book Stuff, Just Having Fun . . .
Well in my tiny little world you have been a star for the last few years both The Man of Sin and A Case for Amillennialism helped re-frame my thinking. The last tethers to dispensationalism had been cut while teaching Matthew, but these two books plus your recommendation of the Dark Side of the Millennium were the final torpedoes in Premillennialism. Sweet!!! I am surprised that nobody contacted you about using your book. Maybe if it was on for three seconds they would have to do that and pay you huge royalties! Nuts - Mark beat me to the punchline! I was going to ask if you got any royalties for this one!!! Since I don't have cable, I thought I would watch it on YouTube, there seems to be a couple of versions of the program posted there, European and American. It's so utterly tragic and complete quackery that they present Haggard and Hinn and the like as experts. Kim mops the floor with those guys. I am embarrassed to be a Christian, not b/c of the gospel and Christ, but b/c of morons like them. And Discover only puts on liberal scholars. I tell people not to watch that stuff - it's bogus. God is gracious in allowing most of us only 0-2 seconds. Otherwise our pride might become unmanageable. Wow, thats great Kim!! 2 seconds is better than none. Congrats. I'm glad they didn't get ahold of one of your spoof covers picturing Obama or you'd have been attacked by the lefties as a "hater". The fact that you've been a legend in your own mind has now been validated! Maybe you should grow a more interesting mustache next time. The History Channel sometimes updates its documentaries. Why not pursue contacting them to add some commentary regarding the Amil position. It may not change stalwart Dispensationalists, but at least people would know there's another perspective out there. I'm perplexed as to why Hinn was on there. Since when has he been considered an expert on prophecy, and if so, by whom. Tim LaHaye even had his hands in The Omen 666 a few years ago. He was featured on the FX documentary that served as the precursor to its release. Sure enough, the movie delved into Dispensational interpretation of Daniel, ruining an otherwise respectable remake. (I liked the film for the plot, not its theology or its depiction of the antichrist,) Here's a question for you. If you were asked to advise on the development of a serious film depicting the antichrist, what advice would you give the filmmakers that would avoid sensationalism and remain true to the description provided in Scripture? BTW, If you haven't done so already, you might be interested in reading Left-Behind or Left Befuddled: The Subtle Dangers of Popularizing the End Times by Gordon L. Isaac. He was my Th.M adviser at Gordon-Conwell Theological Seminary. I liked the book. I'd be curious to hear your opinion of it. That is so cool, congratulations. I agree you should call them, they may interview you. Replacing the Hinn footage with commentary from someone else more qualified to speak about the antichrist, like you Pastor Kim, would be a big improvement. The thing that puzzles me most whenever Revelation is discussed in the public square is that scholars who have written commentaries on the book are never interviewed (at least from all that I've watched). I long for the day when people like my old seminary prof G. K. Beale are asked to comment on the meaning of the book publicly (although, I'd probably be waiting a LOOONG time for that). I'd even settle for comments from non-Dispensational Premillenarian scholars like David Aune, Craig Blomberg or Grant Osborne. While I disagree with them on many levels as well, anything is better for public consumption than Dispensationalism (I'm a staunch Amillennarian thanks to having taken Beale's New Testament Interpretation class in seminary). The real tragedy occurs when 'popular' Dispensationalists strongly imply in the public square that those who don't share their view are 'liberal,' 'mainline' or heterodox. I know those opinions are based on much ignorance, but it's a shame that unbelievers are subjected to them. April 16, 2010 | Neal P.
Congratulations! So now you've got 14 minutes and 58 seconds to go. Better to spread it around than to spend it all at once.